The ensemble of the Smolny (Resurrection) Cathedral is situated in Rastrelli Square. It’s one of the most beau­tiful ensembles of St Petersburg. It makes the cathedral especially picturesque. The name “Smolny” comes from “Smolyanoy Dvor”, meaning “tar yard”. The tar yard was built soon after St Petersburg was laid. Tar was necessary for the ships built at the St Petersburg shipyards. In 1723 the tar yard was moved to another district of the city. In 1744 the Empress Elizaveta Petrovna ordered to es­tablish a convent. The construction of the cathedral and the convent was started in 1748 after the design of Bar­tolomeo Rastrelli. The Smolny Cathedral is one of the best works by Rastrelli. The composition of the ensemble gives the impression of lightness and upward flight. The cathedral was constructed in full accordance with the traditions of the Russian church building. The ca­thedral is crowned with the central dome. Close to the central cupola there are four well-proportioned towers. These towers are crowned with small cupolas. Many ar­chitectural and sculptural expressive details add much to the picturesque appearance of the cathedral faсades. A special effect is achieved by the snow-white stucco mouldings on the bright blue background of the walls. The architectural style of this ensemble is a combina­tion of baroque and classicism. The height of the Smol­ny Cathedral is 85 metres. A bell-tower was supposed to raise 140 metres high in front of the cathedral. The wooden model of this tower is kept in the Academy of Fine Arts. The works were not finished while Elizaveta Petrovna was alive. The interior decorations of the cathedral were finished in the 1830s only, by the architect Vasily Stasov. It looks much more modest than Rastrelli’s design. The building of the cathedral was not completed by Bartolomeo Rastrelli. In 1756 the building rate was slowed because of the Seven-year War and after the death of Elizaveta in 1761 it was stopped. More than 70 years the cathedral stood deserted without the inner decorations’ finishing. 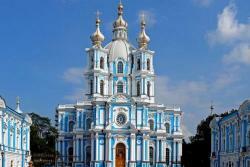 It was only in the 830s that the architect Vasily Stasov completed the building of the cathedral. He kept its ex­ternal appearance without any changes and performed the interior finishing in accordance with the views of later classicism. The architect arranged the entrance and erected a magnificent railing. This beautiful railing sur­rounds the square in front of the cathedral. Now an exhibition and a concert hall are located in the cathedral building. In 1764 according to the Ukase of Catherine II the first Russian school for noble-born girls opened at the con­vent. It was called the Smolny Institute for noble girls. The Smolny Institute was established and initiated by Ivan Betskoy. He did a lot of things for the development of state schools and educational institutions of different levels. The education in the Smolny Institute was for girls from 6 to 18. It was a closed school. Only daughters of high ranked officials and military men were accepted. A lot of the Institute graduates became maids of honour at the courts of empress and great princesses. A seria of portraits of the Smolny first-year and second-year grad­uates is exposed in the State Russian Museum. They were painted by Dmitry Levinsky. Between 1765 and 1775 to the north of the cathedral the building of the school for middle-class girls was erected. It was designed by Yury Felten. It was called the Alex­ander Institute. The building of the Alexander Institute was created in the early classical style. Between 1806 and 1808 to the south of the cathedral on the bank of the Neva the building of the Smolny In­stitute was constructed after the design of the architect Giacomo Quarenghi. It is a creation of the classicism in the prime of years. The architect combined strictness and laconic features of the classicism and the splendour and pomposity of the baroque. These buildings are the masterpieces of architecture. The Smolny Institute functioned till August of 1917. In October the Petrograd Council of workers’ and sol­diers’ deputies were housed in this building. Now the St Petersburg Mayory is situated in the Smolny.